Amazon's Kindle DX is ready for shipment at the warehouse in Campbellsville, Kentucky. On Christmas Day customers bought more electronic books than hard-copy books on Internet retail giant Amazon.com, the company said in a statement Saturday. On Christmas Day customers bought more electronic books than hard-copy books on Internet retail giant Amazon.com, the company said in a statement Saturday. Amazon also said that its e-book reader, the Kindle, "has become the most gifted item in Amazon's history." "On Christmas Day, for the first time ever, customers purchased more Kindle books than physical books," Amazon said. Amazon e-books can also be read on Apple iPhone or iPod Touch devices. The Kindle online store boasts a library of 390,000 digitized books for sale. While Amazon has not released figures for Kindle sales, Forrester Research estimated in October that the Kindle has a nearly 60 percent share of the US market, followed by the Sony Reader with 35 percent. The Kindle also faces competition from the "Nook," a new device sold by US bookstore giant Barnes & Noble. 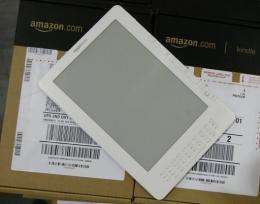 The company said it sold all of its Nooks one month before Christmas, and that the next shipment will not be available until early January. Forrester estimated that three million e-readers will be sold in the United States this year, up from a previous forecast of two million units, and forecast that e-reader sales will double to six million units next year. Marketing ploy - not a big surprise as an ebook could be delivered same day. I would find numbers for the whole season more interesting. True, but an interesting fact, nonetheless. people must have been eager to try out their new ebook readers. Agree on the marketing ploy; year over year print sales would be more reflective of the size of any trend toward ebooks.